Medscape has been around for quite some time. In fact it was one of the first online communities offering specific information for pharmacists. I started using it sometime around 1997. It hadn’t been around for long at that time, but the content was well done. I received an email last week introducing the availability of Mobile Medscape for the BlackBerry; it was previously available for the iPhone and iPod touch. Look up info in seconds for 7,000+ prescription and over-the-counter (OTC) brands and generics, including herbals and supplements. Quickly check interactions between drugs, herbals, and supplements – input as many drug combinations as you want. Review the latest medical news in your specialty right in the app – news updated daily across 30 specialty areas. Our app is designed to make it easier to look up and save drug information, read medical news, and access features. 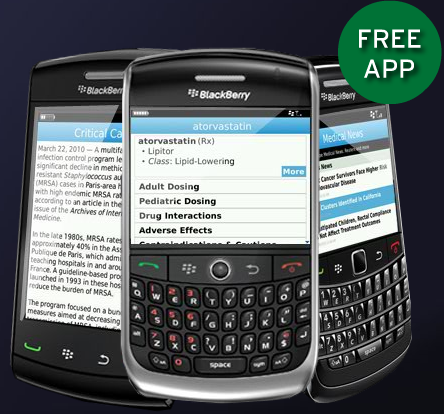 The application is completely free and can be found at www.medscape.com/blackberry. I think it’s great that Medscape Mobile is available for the BlackBerry now, but I have to wonder what the demand for such an application will be with so many physicians, nurses and pharmacists going to the iPhone. It would be interesting to see the download numbers for Medscape Mobile for each platform. More information on the general content of Medscape Mobile can be found here.